A map of the damage area from the Peshtigo Fire at Forgotten Fire Winery. The Peshtigo Fire. The Chicago Fire. Which one is better known? Well, everybody knows about Chicago and how it – according to legend – burned after Mrs. O’Leary’s cow kicked over a lantern. This is supposedly how a conflagration started that consumed over 2,000 acres of densely-populated land, destroying over 17,000 buildings, leaving around 100,000 homeless, and claiming around 300 lives. The news spread quickly around the world and the legacy lives on this day in the form of songs, sports teams and TV shows (both named Chicago Fire), and the city’s Water Tower on Michigan Avenue – a popular tourist attraction due to its status as one of the few structures to survive in the fire’s path. Both fires – and several others in Michigan – took place on the same day: October 8, 1871. It had been a hot and dry summer. 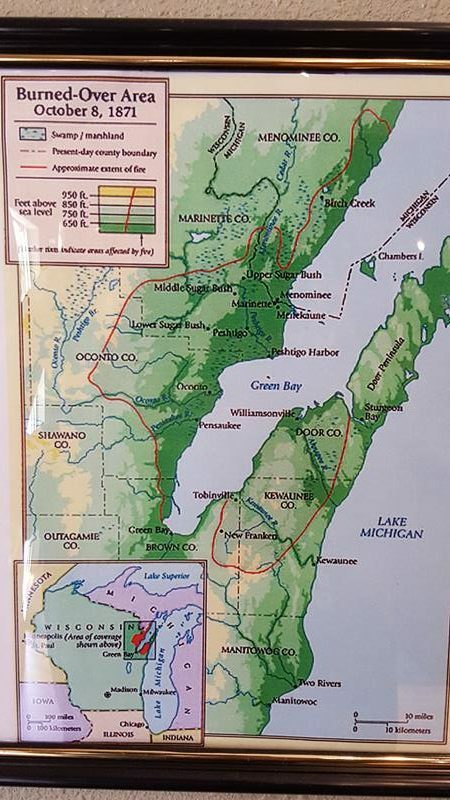 This area of northeastern Wisconsin, flush with timber, had active logging and farming activity going on and a popular way to clear land for farms or reduce brush was to set small fires. On this particular day, it was believed one of the fires blew out of control, fanned by strong southwest winds from a pressure system. The flames created a firestorm in the North Woods, roaring towards Peshtigo, a booming lumber town with a population of around 1,700. The town – like many in this area – consisted almost entirely of wooden buildings. Floors were often sawdust; even the bridges over the Peshtigo River were made of wood. The city knew it was susceptible to fire; several weeks prior, extra water was brought in to combat potential fires that may threaten the town. None anticipated the fury of what was to come. Audible sounds of the fire caught the attention of Peshtigo residents, and the sight of flames became obvious minutes later. The fire rushed towards the town, fanned by strong winds that spread the flames and set trees and wooden construction ablaze. In the end, more than 1.2 MILLION acres and 2 BILLION trees had burned. The death toll never could be officially confirmed; estimates ranged from 1,200 to 2,500. Some jumped into the Peshtigo River to escape the flames and while some survived, many drowned or died of hypothermia, as the river water was already quite cold. Three people hid in a water tank and were, and horrible as this sounds, “boiled to death” when the flames around the tank super-heated the water. Temperature estimates of over 2,000 degrees meant little could survive in the fire’s path; trees literally exploded in the heat and buildings never stood a chance. Fanned by strong winds, the conflagration’s footprint expanded across the northeast Wisconsin landscape, extending almost as far south as Green Bay and north towards the Michigan border. Another fire in Door County around the same time led some to believe the intense fire actually leap-frogged the waters of Green Bay, which was 20-30 miles wide; studies show it was indeed a separate fire. Since the Great Chicago Fire happened on the same day, it got the much larger share of attention and headlines, leaving Peshtigo in the shadows despite its fire taking more lives and burning a wider area. This has indeed led to many calling the Peshtigo Fire, the largest and most terrible, “the Forgotten Fire.” The Forgotten Fire Winery, on the east side of Peshtigo, carries on this legacy. If you want to check out the Peshtigo Fire Museum, you have Memorial Day through the anniversary of the conflagration, October 8th, every year to do so. You’ll find it just off Business U.S. 41 going through town (skip the freeway bypass!) You’ll get an amazing look at history. And feel free to explore more in Peshtigo, now a city of about 3,500! The Peshtigo Fire Museum, along Oconto Street near Business U.S. 41.